Two studies released Tuesday show Apple's growing share of separate markets, with iTunes capturing 25 percent of all retail music sales, and Apple products representing 32 percent of Wi-Fi use. 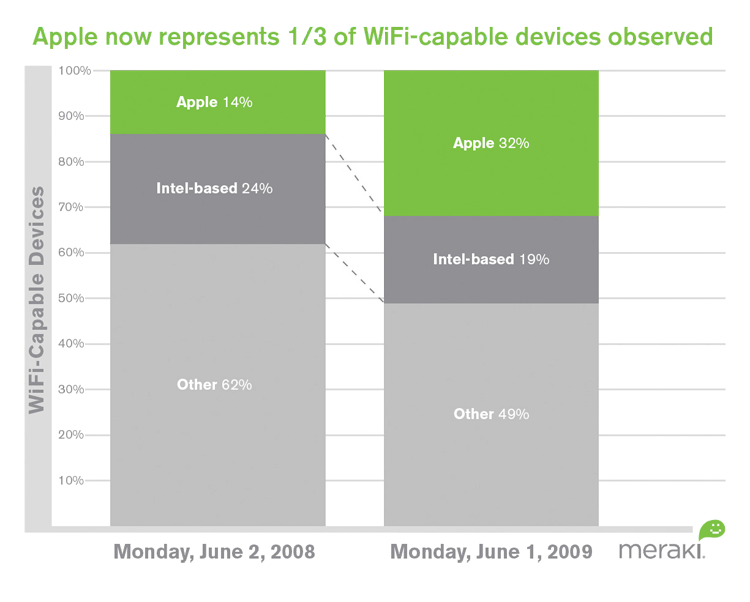 The first-ever census from network equipment manufacturer Meraki shows Apple's massive growth in the wireless device market. In the past year, the use of Apple devices on the company's networks has had a 221 percent increase, bolstered by new Wi-Fi devices like the iPod touch and iPhone. While Apple held just 14 percent of the market share a year ago, the 2009 numbers show the hardware maker with 32 percent of the Wi-Fi capable devices observed. That success is undoubtedly driven by the popularity of the iPhone, which has been said to control most of the market for mobile Web use. Year over year, the total number of Wi-Fi capable devices accessed grew significantly as well. In 2008, 149,687 total devices were seen, while a year later there were 41 percent more, hitting 211,190. Compared to a year prior, the share of Intel devices dipped from 24 percent to 19 percent. Other hardware makers, too, lost share to Apple, with all other devices dropping from 62 percent to 49 percent. But Apple handset competitors Research in Motion and Nokia also saw their market share expand during the same frame. The BlackBerry maker controlled 8 percent of the Wi-Fi market in 2009, and Nokia took 2 percent. "The growth in devices overall is impressive, but the growth for Apple, Nokia and RIM devices is stunning," said Sanjit Biswas, CEO and co-founder of Meraki. "It paints a vivid picture about how people now access the Internet, and the trends we can expect for years to come." New sales data from The NPD Group shows that Apple's iTunes has a 25 percent market share of U.S. music sales. That's well ahead of the number two overall seller of music, Walmart, which has 14 percent. In all, online digital downloads make up 35 percent of music sales. In that category alone, iTunes is the undisputed leader, representing 69 percent of the market. The next closest seller is Amazon, which sells 8 percent of all paid downloads. It's been a short road to the top for Apple, which just entered the top 10 music sellers in late 2005. In 2008, iTunes took the top spot, ousting Walmart. CDs still take the lion's share, with 65 percent of overall sales. In that category, Walmart is the leader, selling 20 percent of the physical medium, followed by Best Buy (16 percent), Target (10 percent), and Amazon (10 percent). "The growth of legal digital music downloads, and Apple's success in holding that market, has increased iTunes's overall strength in the retail music category," said Russ Crupnick, entertainment industry analyst for The NPD Group. "But the importance of the big box retailers shouldn't be dismissed, as long as the majority of music consumers continue to buy CDs."